Trillian application was designed to be a fully featured, stand-alone, skinnable chat client that supports AIM, ICQ, MSN, Yahoo Messenger, and IRC. Trillian is an instant messaging application with a twist: it allows you to use multiple accounts for various IM services. In other words, it has the power to gather all your friends from several messengers in a single interface. 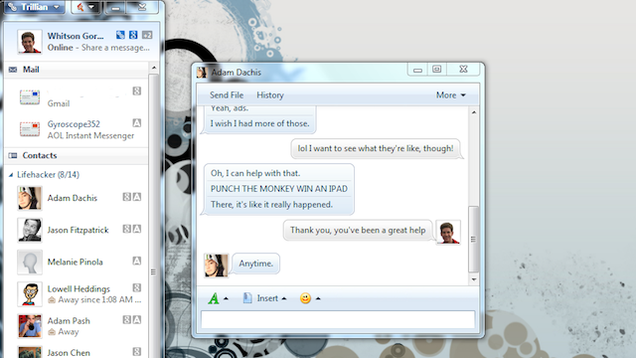 Trillian is worth your while if you need an IM application that can deal with multiple accounts at a time.